Sen. Rand Paul of Kentucky lashed out Sunday at the leaders of the Republican presidential field, hammering Donald Trump as unelectable and inconsistent, charging that Ted Cruz "wants to have it both ways" on a number of issues and calling for Marco Rubio to resign over his absences from the Senate. In an interview on CNN's "State of the Union," Paul said he believed Trump "will get wiped in a general election" and charged that "most of Donald Trump is nothing more than sort of bits of populism, but no consistent conservative philosophy." The Republican presidential contender also got in a dig at New Jersey Gov. Chris Christie, who's been surging in the polls in New Hampshire, where Paul will need to show a strong finish to remain in the race. He that suggested both Christie's and Trump's "temperament" would make them unfit to hold the nuclear codes. "I think this is what is very worrisome about not only Trump, but Christie and others on the stage who are really eager to have war, really eager to show how strong they are," Paul said. "And it also gets to temperament. And that's why it very much worries me to have someone like Donald Trump or a Chris Christie in charge of our nuclear arsenal." Of Cruz, Paul charged that "on several things, he wants to have it both ways ... depending on which audience he's talking to," pointing to Cruz's shift on legalization for undocumented immigrants, his flip-flop on the Trans-Pacific Partnership trade deal from for it to against it and his vote for the Patriot Act after campaigning against it. That charge echoed similar comments made by Sen. Marco Rubio on Florida on another Sunday show — that Cruz, as Rubio put it on CBS' "Face the Nation," isn't the "purist" he claims to be. "When you run by telling everybody you're the only purist in the field, you're the only one that's always consistent conservative, well, I think then your record is going to have a light shown on it," Rubio said. But any accord between Paul and Rubio ended there, as Paul continued his feud with Rubio on Sunday, declaring that "the difference between Marco Rubio and I is, I show up for work." Paul noted Rubio didn't vote on the major spending package that passed this week in the Senate, "the biggest vote of the whole year." Rubio came under fire from opponents this week for skipping out on the vote to campaign in Iowa, while his two 2016 opponents in the Senate, Paul and Cruz, made it back to record votes against the bill. Paul first called for Rubio to resign Friday, and he again said Sunday that the Floridian "ought to resign or give his pay back to the taxpayer." His comments come as Rubio dismissed him, in a clip from the "Face the Nation" interview that was released Friday, as "the only person running who likes politics so much, he's running for two offices at the same time." 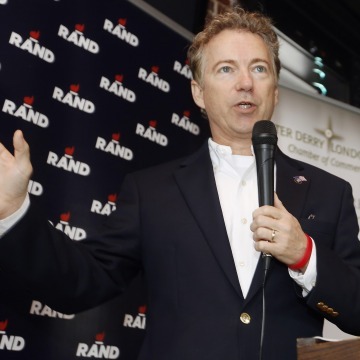 Even as Paul faces an uphill battle for the Republican nomination, he's also running for reelection back home in Kentucky, a decision that's frustrated some Kentucky Republicans who would rather have Paul focus on his reelection fight. On CNN, Paul — who's polling seventh in the Real Clear Politics average of polls — dismissed questions over whether he'd continue with his lagging campaign or end it to focus on his reelection fight. "We're in it to win it," he said. "We're not in it just to mess around." Paul pointed to faulty polling as underestimating his campaign and said "we have got a campaign that we think is going to shock people." "And we're hoping that when we get done with this campaign and people see the votes happen, that we will begin discounting the pollsters, who, I think, have no clue as to what is going on in America," he added. Paul did acknowledge, however, that "if we're in the lower tier [in the early primaries], we'll reassess."